TAOS, N.M. (Reuters) - Three people were released from jail in Taos, New Mexico, on Wednesday after a judge dismissed charges of child abuse at their desert compound where a toddler's body was found, a defense lawyer said. Judge Emilio Chavez ordered charges to be dropped against Lucas Morton, his wife Subhannah Wahhaj and her sister Hujrah Wahhaj because prosecutors had failed to follow a procedural rule after they were charged and jailed. "They're out now," said Megan Mitsunaga, a defense attorney for Subhannah Wahhaj. The three still face a criminal trespassing case in magistrates court in Taos County for building their makeshift settlement on a plot of land near Amalia, New Mexico, that did not belong to them, Mitsunaga said. She said they had mistakenly built it there. She said state prosecutors had not indicated whether they intended to file new charges against the three, who have been accused by police and prosecutors of planning attacks on "corrupt institutions." Another New Mexico judge on Wednesday dismissed child abuse charges against two other defendants from the compound based on the prosecution's failure to follow court procedure. 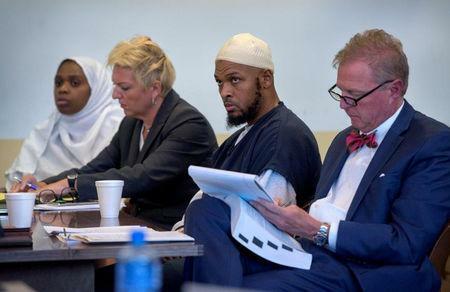 The two, Siraj Ibn Wahhaj and his wife Jany Leveille, are facing separate charges related to the death of Wahhaj's three-year-old son at the compound. They remained in custody. The five defendants were arrested after an Aug. 3 police raid on their makeshift encampment in Amalia, New Mexico, after reports that their 11 children were starving. The children were taken into protective custody. The body of 3-year-old Abdul-Ghani Wahhaj was found three days later in a tunnel at the compound. The two judges received a storm of criticism on social media after they dismissed the abuse charges. Another judge received death threats for granting the defendants bail earlier this month. The Taos County Sheriff's Office and prosecutors have described the defendants as "extremists of the Muslim belief" who were training their children to attack schools and other "corrupt institutions." Police have not brought any charges in relation to those accusations. Ibn Wahhaj and Leveille did not enter a plea on Wednesday on a separate charge that they caused Abdul Ghani's death by not giving him medication for seizures. Leveille, a Haitian national, is also being held on immigration charges. Tom Clark, an attorney for Ibn Wahhaj, said the prosecution should just focus on the remaining charges against his client. "One of the big problems in this case is all the ancillary, inflammatory allegations, when really this case always should have been about a dead four-year-old," said Clark. State prosecutor Timothy Hasson declined to comment. Abdul-Ghani was abducted from Wahhaj's first wife in Georgia and died on Dec. 24, according to the Taos County Sheriff's office.